J.O. No. 2 "Crab House Spice" - A ready mix that is a custom blend of spices and salt which adheres to the crab. 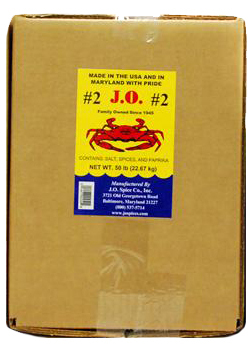 This blend allows for uniform portions to be applied to crabs. It saves time and you get it right every time. A true Chesapeake Bay flavor. Add after you boil or before you steam. For use on Blue, Dungeness, King and Opilio Crabs. It does not get any better than this !! !